If you have jetted out of Delhi’s T3 Terminal in the last couple of months, you may have noticed HomeShop18’s Virtual Shopping Wall called Scan n Shop. Strategically located, the prominent wall is a super way of integrating M-Commerce with the airport shopping/browsing experience for travellers. 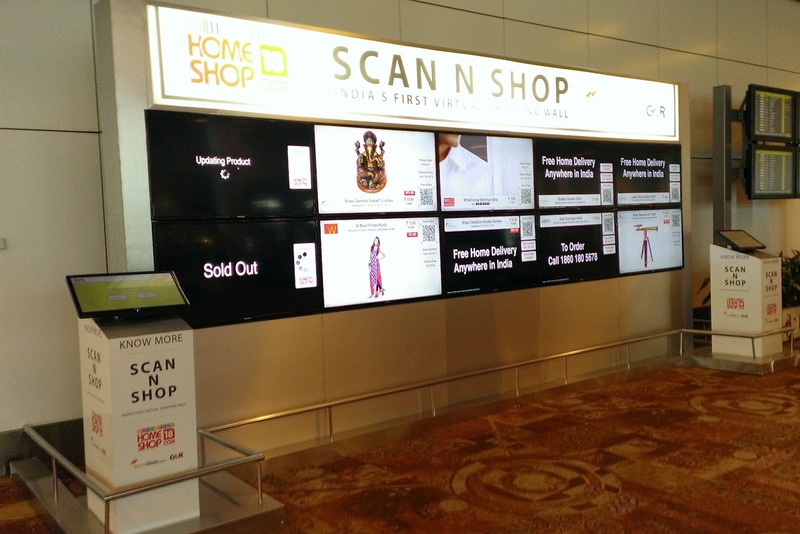 The dynamic wall displays top deals on HomeShop18, and corresponding QR codes. One can scan the code and get immediate access to the deal on the phone. The experience for me was seamless, quick and impressive. If you like something, you can immediately place a one-click order through your phone. Shoppers without smart phones have the option to call the HomeShop18 toll-free if there is a deal that catches their fancy. The setup also has kiosks available for more information. Innovation is the key to getting eyeballs in E-commerce, being the competitive category that it is in India. This is a great way to increase awareness and engagement for HomeShop18 with their potential consumers. In my opinion, the concept is ideal for browsing deals. The format also provides means for conversions but that would depend on a lot of other variables including compelling products and pricing. It would be interesting to see how this execution is tracking with respect to scans and final sales. Homeshop18.com is a very popular online shopping website in India. It can be called as a one stop destination due to its collections of varieties of products in all ranges for different brands with great discount.